Mail merge campaigns sent via GMass can now be click-tracked. To turn on click-tracking for a mail-merge campaign, just check the box in the Settings box before clicking the main GMass button. Note that click-tracking is turned on by default. and then you copy/paste that tracked URL into another campaign, it will be left alone and not converted again. When someone clicks on a link in an email campaign, a report will go into the GMass Reports –> Clicks label in your Gmail account. In order to prevent your links from looking like phishing links, we do NOT TRACK links where the anchor text itself is a URL. Hey Ajay, I am currently having a problem with a Gmass Reports label on the gmail, it simply doesn't appear neither in the gmail bar, nor in the settings. Tried to search it up on the Internet, but didn't succeed. Would you please tell the possible reasons for this problem? Nandin – The "GMass Reports" label only shows up AFTER you have at least one reporting event take place, like an open, or a click on an email sent via GMass. You can send yourself an email with GMass, and open it, and then the labels will show up on the left. I can only track open clicks if the email is sent to one person. Is it possible to tracked opens if it sent to more recipients? Are there any plans to create a user-friendly dashboard to follow email tracking? It's awesome to see who's opened emails, but quite difficult to manage and make business decisions when the data comes in the form of a ton of emails. Karolina — yes, GMass tracks opens to all recipients of a mail merge campaign. Make sure your emails are HTML emails. You can do that by making any word bold or adding at least one link. Gmail will sometimes default to plain text instead of HTML, if nothing in the body of the email requires HTML. Feel free to email me at hello@gmass.co if you need more help. Yes, I know our Reporting isn't the greatest right now. We won't be creating a dashboard, because my software development philosophy for GMass is to create a UI-less experience, but I will improve the email notifications that you get when there is an open or a click. Stay tuned for that. Hi Ajay I need help with none of the buttons working in my Settings. Have emailed you a screenshot and video to show that each click does nothing. Have re installed and disabled all other Extensions etc. Still no buttons work. Please help. Hey Greg – I sent you an email to schedule a screen share session for Friday morning Chicago time. I'm sure I can figure out what's going wrong during that session. 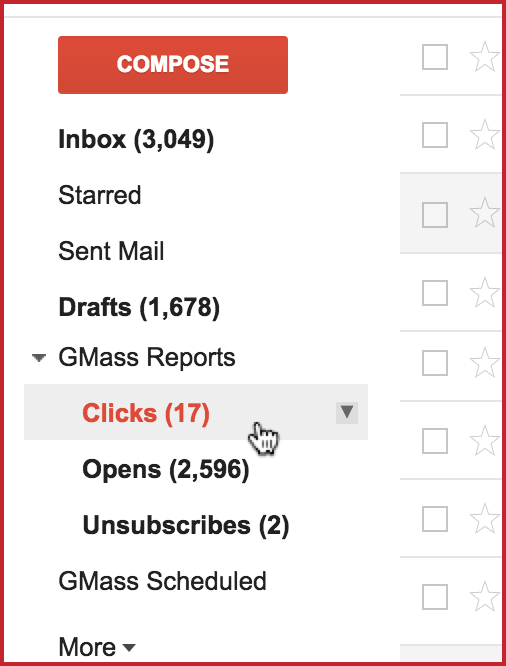 I just installed and tested Gmass with 11 test emails. I used my own gmail accounts and those of my coworker. 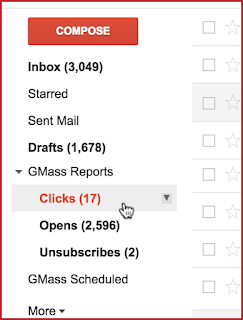 I checked the opens in the Gmass reports and it shows 3 of my gmail accounts opened the email when in fact, they did not. What's the cause of this and how can I fix it. This is worthless to me if I'm getting phantom "opens" and possibly clicks that aren't taking place. My partner opened one of the emails sent to her hotmail account once and it shows she opened it 6 times. The click tracking isn't working at all. Hi Ajay! Gmass is so cool, I love the daily report of my campaign. Will you send us a final report to after the whole campaign ended? thanks for the info, just i need to know what to expect. Reports are far less important than using opens as a search term for follow-up. Hi Ajay! While we're loving the GMass for the personalization, it's really not showing up any track reports for emails opened, unsubscribed or link tracking. What exactly to expect? Is there anyone we can write to, in the team? Steve – it's likely that you opened those messages yourself from your Sent Mail folder. That is the one flaw with open tracking right now. If you open the messages yourself, then it will count as the receiver having opened it. Would it be possible to not count the sending address as opener of the email ? I just realized that if i open a bounce (which arrives at first in the inbox), it does count as an OPEN, making it quite confusing. Declaring one or even a couple of adresses (for testing) which should not count as open would be a very neat feature. Click tracking is working perfectly. Can you elaborate when you say it isn't working? Right now, there is no final report that is sent, but I'm working on that feature. Right now you get real-time reports after any event (open, click, unsubscribe). It's likely that you're not looking in the right place for reports. Be sure to click the expansion triangle to the left of the "GMass Reports" label to drill down and see the sub-Labels. Hi Ajay! Playing around with using GMass, particularly for click tracking, but when I send an email using the Chrome extension, I do not see any reports for clicks. I have Campaigns, Opens, Replies and Sent Copies. Gregory — are you sure you've registered at least one click for an email you've sent? And that you had "Click Tracking" turned on? Email me at support@gmass.zendesk.com with your Gmail account address and I can tell you what's going on. I have a campaign to run where I have 10 different email templates to email but all have got only one link to track. I will be using the same link in all my 10 campaigns. How to track this, please explain ? GMass isn't the right tool for you. Try MailChimp. Can the links be masked somehow so if recipient check the hyperlink they don't see gmass.co? Hi there. Can i set the picture in an GMASS email to link to a google form? Because now when an image of an GMASS email is clicked it'll go straight to http://www.gmss3.com/. Pls help? If I send a campaign and I am tracking the opens, I have noticed if I forward it to my CRM software and the email is opened it counts as an open email. Anyway to check where it was from? It does not track/convert if we use a custom field from excel spreadsheet. I am seeing the email I sent to one person is being opened on multiple times. Does this indicate the orgininal email I sent was forwarded to others who are now opening it? I need to use the same URL at 2 different campaigns, and to track this URL for each campaign. I’m still on the testing phase. I have tried sending emails to 2 different email addresses and see how fast I should receive it. So far I have not received the emails on both accounts. Is it possible to retrieve a full list of clicks on all campaigns. Can I get a list emailed to me? Or is there a way to retrieve a whole list of all of them? How do you know who has clicked on UNSUBSCRIBE button in the emails sent through Gmass? How do you track those people who do not wish to recieve our emails from gmass? My gmail ka draft message lost .. I was curious about if you ever considered changing the page layout of your site? It is well written; I really like what you have got to say. But maybe you can create a little more in the way of written content so people could connect to it better. Youve got an awful lot of text for only having one or two photos. Maybe you can space it out better? Thanks for your feedback and will be taking that into consideration in the future as we are trying to continue to improve not only the content but also the aesthetics of our site to ensure ease of use and readability. As discussed, we can draft unlimited Emails per day.there are only 490 emails per day are working…May I Know what is the reason for 490 emails working only per day. Can I get a explanation of SendGrid tool extension for GMass.